Discussion in 'Designers and Collections' started by Lena, Feb 20, 2004.
following Versace, Bulgari, Molinari, Diesel and Ferretti, Armani is preparing his first lux hotel in Milan. MILAN — Giorgio Armani is checking into another new world. WWD has learned that the designer will announce on Sunday an ambitious venture to open luxury hotels in partnership with a major, publicly listed company. While the details could not be learned — including the identity of the new partner — the venture fulfills a long-held ambition of Armani’s to bring his signature design style to the travel industry. Armani first started talking about a hotel in 2000, when he opened his Via Manzoni megastore, his sprawling, three-level space that houses the Emporio Armani collection, the first stand-alone spaces for the Armani Jeans and Casa lines, Armani fragrances and accessories, a cafe, a bookstore, a Sony store, Armani Fiori (flowers), Armani Dolci (chocolates and confectionery), the Japanese restaurant Nobu and, the latest, his exclusive club, Armani Privé. The idea is turning into reality. The move comes as Armani continues to grow his $1.6 billion empire by expanding his product offering with his home collection, launched in 2000, fine-tuning the distribution for his Collezioni and Emporio lines, consistently working on his retail expansion and even finding time to design a car for Mercedes. All this has occurred as Armani has firmly kept his company private and again and again said he has no intentions of retiring just yet. Armani’s new hotels will be in good company. Bulgari SpA linked up with Marriot International Inc. in February 2001 to open a string of hotels around the world. The first one is expected to bow in Milan later this year, followed by up to five more over the next four years. At the time the venture was announced, Francesco Trapani, Bulgari’s chief executive officer, said the hotel industry then generated more than $300 billion a year, with the luxury segment representing about 10 percent of that. Sources said that the Armani hotel venture will be similar in its long-term vision to that of Bulgari’s, but different in every other detail, including the nature of Armani’s partner and the structure of the deal. since it will be located in the heart of Milan. Armani Casa has uber chic lines. to own or visit a designer hotel. the Corso Como 10 boutique. Ummn, an Armani Car? Want to see that! There's a hotel within 10 Corso Como? I had no idea! I stayed right around the corner from there at the Hotel Una Tocq (sp?). I literally ate or drank there every nite we were there. And could have set up camp in the store. I will definitely look into the hotel for the next visit. He already did one a while ago, a Mercedes CLK. As part of a promotion between DaimlerChrysler's Mercedes-Benz division and Giorgio Armani, president and chief executive of the Armani Group, the Italian fashion icon has worked his magic on a version of Mercedes' new CLK-class convertible. The companies plan to collaborate on more designs in the future, but for now their only child is the handsome Armani edition of the CLK. Unfortunately, to the disappointment of Mercedes fans and fashionistas around the world, the car might not get beyond the prototype stage. "They want to make it a production car, but there are no definite plans," says Frederick Heiler, vice president of Magnet Communications, a firm that works with Mercedes-Benz in the U.S. "There are still discussions going on between Mercedes people in Germany and Armani." DaimlerChrysler (nyse: DCX - news - people ) says in a statement that "a limited-edition production version will be made available for special order in the Mercedes-Benz Designo Program." This is the custom paint-and-leather shop that can, if you want, give your Mercedes a combination like "orange leather and yellow exterior paint," says Heiler. 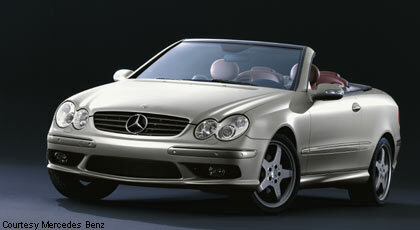 The Armani CLK might not come to the U.S., however, even if it is sold in Europe by Designo. Fortunately for Designo, Italian good taste, not orange leather and yellow paint, is the order of the day for the CLK Giorgio Armani Design Car. 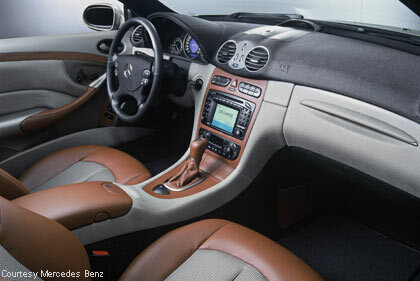 The car was developed in Italy, where DaimlerChrysler's Advanced Design Studio in Como could implement design directions from Armani, which is based in Milan. Daimler's press release on the vehicle says, "Giorgio Armani's concept in designing the color and material for the Mercedes-Benz CLK Giorgio Armani Design car was to bring back that sense of handcraftsmanship that one associates with vintage cars." Maybe the most impressive feature of the car is Armani's use of Cuoio, a combination of leather that was popular in the 1940s and '50s. Although the leather's style is old, the vehicle features what Daimler calls "high-technology fabrics adopted from present-day sportswear." The leather anchors an interior that seeks a high degree of consistency in terms of color. In fact, a shade of sand called "Sabbia" dominates the interior and exterior of the vehicle, and every color on the Mercedes is derived from it. The reason it doesn't get boring, says Daimler, is because of the "contrasts [that] are created by juxtaposed matte/high-sheen surfaces of the car's interior and bodywork." So why wouldn't Mercedes and Armani build the car? Hasn't Ford Motor (nyse: F - news - people ) had a big hit with its Eddie Bauer-designed Explorer package? Although no one at Mercedes would speak on the record when asked this question, it would seem that the Armani-inspired CLK is just a foreshadowing of what the two companies hope will be a bigger relationship down the autobahn, or strada, as the case might be. Armani-designed Mercedes sunglasses or keychains, anyone? Not exactly the most stylish colour palette for a car IMO. And instead of such, shall we say, frivolous endeavours, I think Mr. Armani should instead focus his attention on the brand itself, which is fast becoming staid and passe in an ultra-competitive industry. At the top end it's quickly losing its appeal against more hip and coveted labels, but at the same time it hasn't reached the timeless, in-for-the-long-run status of some prestigious houses because of its numerous diffusion lines at the lower end of the market. The man himself also isn't getting any younger, and it'd be wise of him to gradually groom up a capable successor, or else the brand would virtually collapse should he decide to retire, either by will or by force. As of now I find little incentive to drop my cash on an Armani Collezioni item that's most probably made in the Far East with questionable quality, when for the same or even less cash I would be perfectly happy with a purchase from Jil Sander or Helmut Lang. But that's just me. a friend who stays there when in Milan, said that its not too far from the store. We have our own line of designer hotels in the US. Well Starck designed most of the hotel interiors and has also designed some clothing ....dont know if you would call him a fashion designer though and he is french. Just thought id add my 2 cents ....hehe. Paris hilton should join forces with tom ford, calvin, ralph lauren and other american designers and redo some of the top Hilton hotels. Now that would be cool. french or not, i dont regard Stark as a fashion designer. I 've got some info I think I read an art. in the guardian, but can't find it now. I really don't have a problem with this, just as long as the designer wanting a hotel is in his vision not really just to cash in on his name. I'm sure, as Lena said, great minimalism, and good taste. Plus, Armani Casa has uber chic lines. PS The Corso Como 10 rooms (I saw them on Fashion File) are gorgeous. Oooh, now I want to stay at 10 Corso Como! I am sure it would be fabulous. I am loving the great boutique hotels being established around the world. Many of them are so stylish. It's on the Gold Coast in Australia. I have stayed there a few times, and it was - well - an experience! They do have a very good Masquerade Ball though.